More than 150 Nobel Prize-winning scientist have contributed their work to Scientific American since its introduction in 1845. As one of the longest-running magazines in the United States, every issue strives to be a trustworthy source of newsworthy topics covering medical breakthroughs, progress in technology, and space exploration to name a few. Each article is curated by expert writers and researchers as they set out to answer the toughest questions while pioneering groundbreaking innovations. You’ll find thought-provoking, and sometimes challenging topics that can be approached by anyone with a curiosity for new ideas, or wants to expand their knowledge on a particular subject. Start your journey through the past, present, future with regular features that include: “Skeptic,” where you will view the world with a rational eye while challenging convention; you won’t want miss these “Recommend” book picks covering fiction, pioneers in science, biology, mass destruction, and much more; “Anti Gravity” bucks convention and urges us to think different; “Forum” opens the room to advocates of large ideas, or gives voice to the unheard; finish by looking back at stories appearing in Scientific America “50, 100 & 150 Years Ago” to see how far we have come and where we may be headed. Plus, look forward to receiving the popular “Single Topic Issue” that delves deep into one important subject. 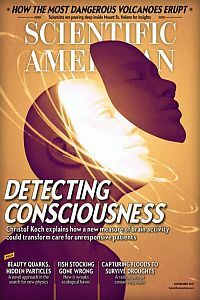 Whether you’re a curious person who loves to celebrate new ideas or a skeptic who wants all the straightforward facts, Scientific American is the kind of in-depth magazine that satisfies your thirst for knowledge. Be one of the first to find out what people on the cutting edge of science are discovering. Get your subscription to Scientific American today so you don’t miss a thing!